The order in which you apply your skincare products will help you maximize their benefits. Cleansing is essential, as is starting with the lightest products and finishing with the heaviest creams and oils. Experts recommend choosing the right products and adjusting your routine to suit your skin type. Applying skin care products in the right order — also known as layering — will ensure that your beauty regimen provides the best results possible. Using products in the wrong order will not only be a waste of your investment in quality products, it may even cause damage, ranging from irritation and dehydration to breakouts. We researched skin care layering techniques and consulted the experts to outline the ideal sequence in which skin care products should be applied. Here’s what we found out. Simply cleansing the face does not cut it when it comes to makeup removal. Makeup is often made with heavy oil-based products and warrants a strategic approach to break it down and wash it off thoroughly. Oil attracts oil — as such, a cleansing oil is a viable first option and an effective makeup remover. Using an oil-based remover will also help you avoid harsh scrubbing, which prevents natural oils from being stripped away from the face. Coconut oil’s antibacterial and detergent properties make it a good option for makeup removal. Note that in some instances, it may block pores and cause blackheads as the solvent agents used in the extraction process can bind to the lipids in the coconut oil, allowing toxins to be absorbed by the skin when applied. However, this can generally be avoided by using a good quality organic and minimally processed product. Look for brands that only contain cold pressed oil, for instance, as these harbor no toxins in the manufacturing process. Not all skin types are compatible with coconut oil, so integrating this product gradually into your routine will help keep breakouts at bay. One good option is Viva Naturals Organic Extra Virgin Coconut Oil. 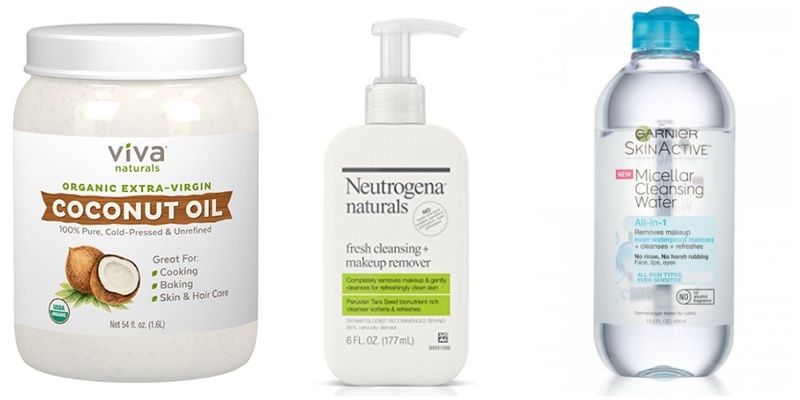 Another quality makeup remover is Neutrogena Naturals Cleansing Makeup Remover — it’s made of 86% naturally derived ingredients and is set at a price point that is hard to beat. Garnier’s SkinActive Micellar Cleansing Water for Waterproof Makeup is another good option as it is devoid of fragrance, sulfates and silicone, and comes with excellent consumer reviews. According to the American Academy of Dermatology, it’s best to use an alcohol free, non-abrasive cleanser. Simple alcohols are often found in toners and astringents, particularly those that target oily or acne-prone skin. These products may diminish the immediate appearance of oil, but to compensate the skin will actually produce more oil, becoming more prone to acne in the long run. 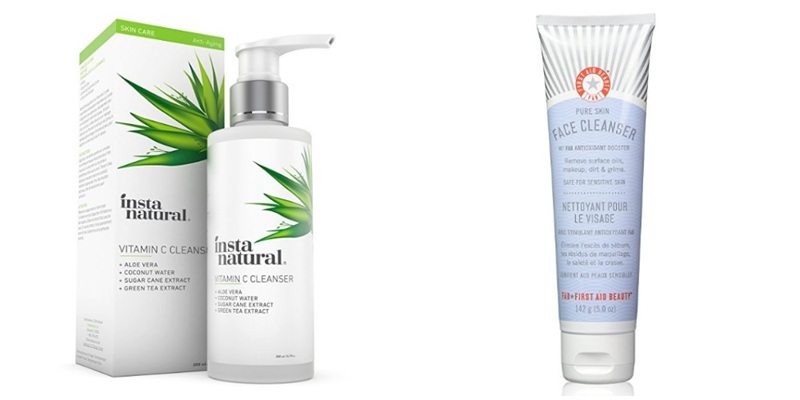 Gentle, fragrance free cleansers are a better alternative. Spindler further explains that these free radicals and other environmental stressors break down the skin, making it age faster. “Adding a product with an antioxidant will protect the skin from oxidizing or breaking down,” she notes. When choosing a cleanser, go for an alcohol-free product that’s mild and contains antioxidants. Insta-Natural’s Vitamin C Facial Cleanser is a best seller that contains potent antioxidants like vitamin C and natural organic aloe. It is suitable for all skin types. If you prefer a cleanser with a creamier texture, try the First Aid Beauty Face Cleanser. It is also infused with antioxidants and helps maintain a balanced skin PH. 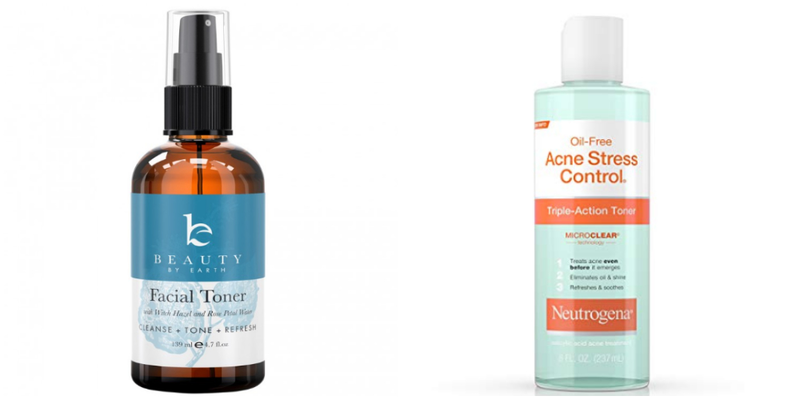 The necessity of using toner in skin care is much-debated. Used to rebalance skin after washing with harsh soaps and cleansers, toners were once a popular choice for acne-prone skin to help shrink pores and clear away excess oil. They also used to be strictly alcohol based and were quite drying for the skin, which earned them a bad reputation in skin care. Times have changed and with the vast array of milder products available, a toner can be a great add-on step. Modern-day toners help prepare the skin for moisturizers and serums without harshly stripping the skin. Toners now use ingredients that can help fight aging, acne and redness. The Beauty by Earth Facial Toner with witch hazel is a good option as it can help soothe and detoxify all skin types with the aid of natural and organic ingredients. Dr. Shainhouse recommends Neutrogena’s Acne Stress Control oil-free toner, which contains salicylic acid and natural ingredients. If you are baffled as to what a serum does, a simple explanation is that it delivers a high concentration of active ingredients directly into the skin. While younger skin generally doesn’t usually need much more than a gentle cleanser and daily broad-spectrum sunscreen, Dr. Shainhouse says that it can be helpful to get into a healthy, preventative skin care regimen early on by using serums. They’re ideal for targeting specific concerns like wrinkles, dullness, acne, or dehydration. Using a serum regularly can help skin appear firmer and smoother as it minimizes pores and increases moisture levels. According to Dr. Shainhouse, it’s important to look for retinoids in a serum to help fight aging and stimulate collagen production. She recommends Neutrogena Rapid Wrinkle Repair Night Serum as it contains retinol. If sun and environmental damage are a particular concern, Dr. Shainhouse notes that vitamin C can be useful as it acts as an antioxidant to prevent damage from UV rays and pollution. 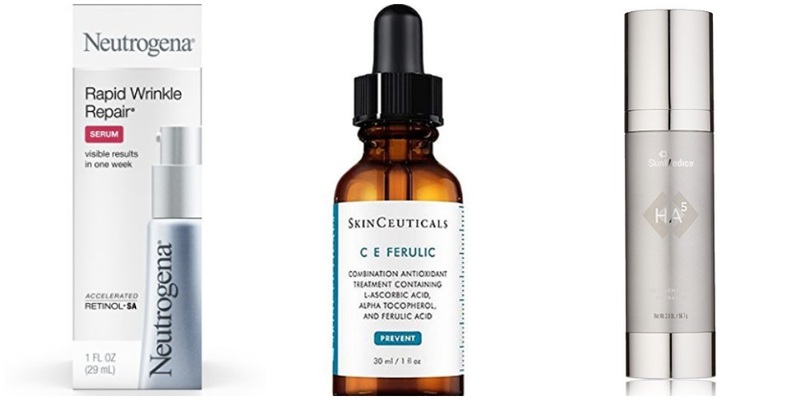 For a quality serum containing vitamin C, she suggests using Skinceuticals CE Ferulic. For hydration issues, Dr. Shainhouse recommends using hyaluronic acid (HA) to physically bind water to the skin, which can be found in SkinMedica’s HA5 Rejuvenating Hydrator. Eye creams are specifically created for the delicate skin around the eye that is more prone to dryness, and tend to be thicker than regular moisturizers as they contain more oil. Consistent and frequent use of eye cream can help preserve eyelid skin elasticity and improve or prevent fine lines or collagen loss. “Because the skin around the eyes is thinner and more delicate, it is easier for this area to become more puffy, inflamed and wrinkled,” says Beverly Hills plastic surgeon Dr. Babak Azzideh. Dr. Azzideh recommends Hydrafirm ZO as an eye cream. Don’t let the hefty price tag on this item scare you off – skin care professionals seem to agree that it is one of the best products on the market. If the cost of medical-grade products is too steep, look for an eye cream that contains retinol to help strengthen skin and reduce imperfections, vitamin C to aid in collagen production and skin elasticity, and vitamin E to soothe and protect skin. 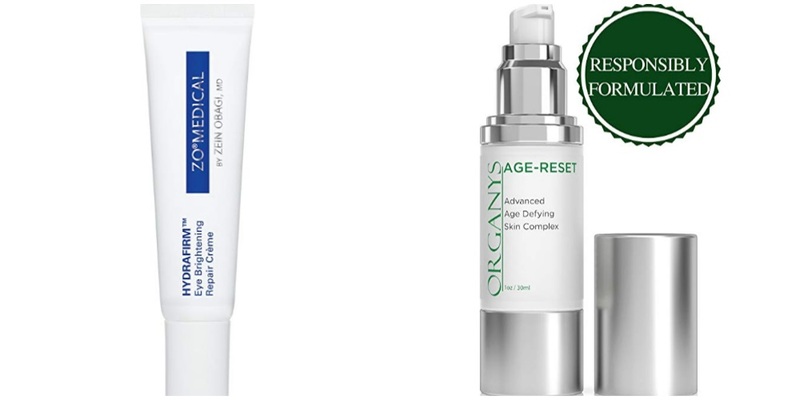 Set at a very affordable price point, Organys Eye Cream is a responsibly formulated product that contains vitamin C.
Though your skin has its own natural hydration system that creates a protective barrier, most of us — even those with oily skin — need extra hydration after daily sun and harsh environmental damage. When choosing a moisturizer, look for ingredients, such as glycerin, ceramides, coconut oil and other plant-based oils. The best time to apply a moisturizer is when the skin is still moist. After using a gentle cleanser, lightly pat your face dry so that it remains a little damp. Next, apply your serum and eye cream, and then a layer of moisturizer to lock in the hydration. Dr. Saffie Siebert explains that particles, especially from traffic congestion, are considered among the most harmful components of pollution for your skin. Because they’re so tiny, they can infiltrate the deeper layers of your skin, creating free radicals that move around and strip away collagen while increasing inflammation. When skin becomes inflamed and, in turn, dry, it can compensate by producing more sebum, which then clogs pores. For an effective moisturizer, Dr. Saffie-Siebert advises looking for products that help your skin shed dead cells, clear pores and reduce the signs of inflammation during new cell formation. She recommends her company’s moisturizer 001-Pu: Purifying Face Cream, which uses the natural mineral silicon (not to be confused with silicone) to carry the right combination of ingredients to where they need to be and releases them over time. 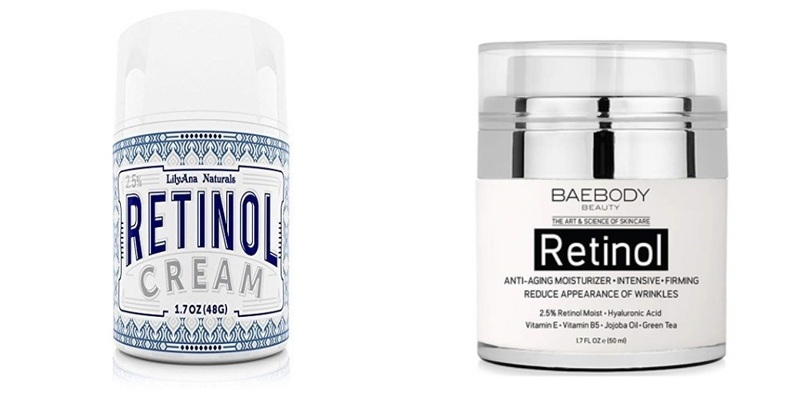 Alternately, try the Baebody Retinol Moisturizer, which is composed of 71% natural ingredients as well as retinol and vitamin E to help diminish the signs of aging. Another option is LilyAna Naturals Retinol Cream Moisturizer that contains HA and vitamin E.